Andrew Erskine '14 leads the Jeffs in what hopes to be one of the program's most successful seasons ever. 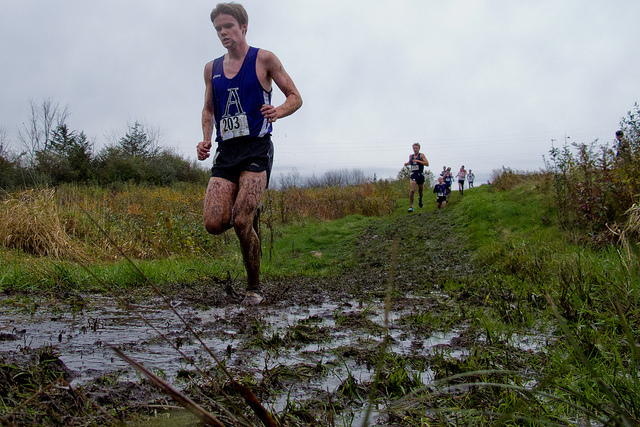 The Amherst cross-country program seems primed to make a leap forward this year, as both the men and women look to build on successful 2011 campaigns to achieve new heights in 2012. The men’s squad exceeded all expectations last season, shedding the ‘rebuilding’ label that had been attached to them after the loss of two consecutive senior classes, which included the remaining Jeffs who raced in the 2009 NCAA Championship. Andrew Erskine ’13 stepped up and cut over two minutes off his 2010 time, becoming a go-to runner in the process and earning a trip to Nationals. Erskine and the rest of the Jeffs gained momentum as the season went on and began to showcase their potential as the fall wound down. Amherst finished its championship competition by earning sixth place out of 44 teams at the ECAC Championship and grabbing eighth place in a 48 team field at the NCAA regionals. This season, with contributors such as Dillon Buckley ’13 and Patrick Grimes ’13 joining Erskine as seniors, the Jeffs should be able to replace the lost production and leadership of the Class of 2012, which included track standout Ben Scheetz, Alec Jacobson, and Geoff Ainslie. In addition, Greg Turissini ’15 and KC Fussell ’15 should be able to improve on their impressive efforts as first-years to make an even larger impact on the team. The development of Fussell, who paced the Jeffs in multiple meets last season, should be especially intriguing to watch. While the men are looking to regain the status of NESCAC elite this season, the women will try to solidify and improve on their place in the top three of the conference. However, the successful program will be undergoing a transition period with Cassie Funke-Harris taking the helm as head coach, replacing the departing John Adamson. Funke-Harris spent the last six years as an assistant cross country and track and field coach at Carleton College, where she also starred as a cross country runner in her college days. During her tenure, the Carleton Knights produced 10 all-conference runners, 13 all-region honorees, and two All-America selections. After helping to develop running talent at Carleton, Funke-Harris inherits an impressive group of runners in her first year at Amherst. Led by standout Keri Lambert ’13, last year’s team finished third at the NESCAC Championship and fourth at the NCAA regional meet. To conclude the campaign, the Jeffs came in eleventh place at the national championship meet. As mentioned, a huge part of that success is attributable to Lambert, who paced the team in all seven races she participated in and placed fifth at the national meet. She also ran the fastest Division III time at the NEICAAA meet to put herself on the map as an elite runner on the national level. Joining Lambert as a team leader this season will be Ali Simeone ’13, who ran the team’s fastest time at the 2009 NCAA Championships and achieved 2010 All-America honors. Other important contributors include Lauren Almeida ’13, who joins Lambert and Elodie Reed ’13 as a team captain, as well as Sarah Daly ’13. In addition, eight first-years will join this already deep squad as it attempts to sprint past the pack to reach the pinnacle of the NESCAC.